According to the DC government, this is not okay. We've all heard stories of children's lemonade stands being shut down for lacking the proper permits. Now, a similarly ridiculous example is the kerfuffle over a neighborhood tree house that critics say intrude into public space. Of course, the location of this nonsense is Washington, DC, the regulatory capital of the country. 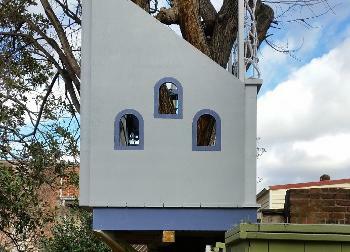 A family's tree house is under legal scrutiny because it protrudes into an alley by about 20 inches. There have been orders to stop work, and the city has said the family should have obtained the proper permits before building. Far from being a case of negligence, however, it appears that the family did everything in their power to ensure the building was legal, including filling out paperwork, seeking tree house guidelines (which don't exist), and even hiring a specialist to ensure they weren't harming the tree. They also distributed fliers to neighbors prior to building, so no one can claim they weren't consulted. It was apparently not enough. Incidents like this may seem trivial, but they highlight the dangers of a legal and regulatory system blind to common sense and individual circumstances. Whereas the system of Common Law once valued reasonable solutions based on tradition and reason, the more modern system of statute law leave no room for the application of judgment, even when the outcome is plainly unjust. It's a triumph of mechanical bureaucracy over humanity. When we allow black and white regulations to cover every aspect of life, whether or not an individual is subject to punishment or left alone becomes merely a matter of authorities' discretion, having very little to do with the individual's behavior or whether anyone has actually been harmed. This is why it's so important to hold regulatory agencies accountable and roll back some of the overcriminalization that is in danger of making us all guilty in the eyes of the law. I am here for the share you this wonderfull blog must be like it you can follow here http://syncsettingswindows10.com and save the all outlook sync settings windows 10 this is the batter way of access the all update of system.